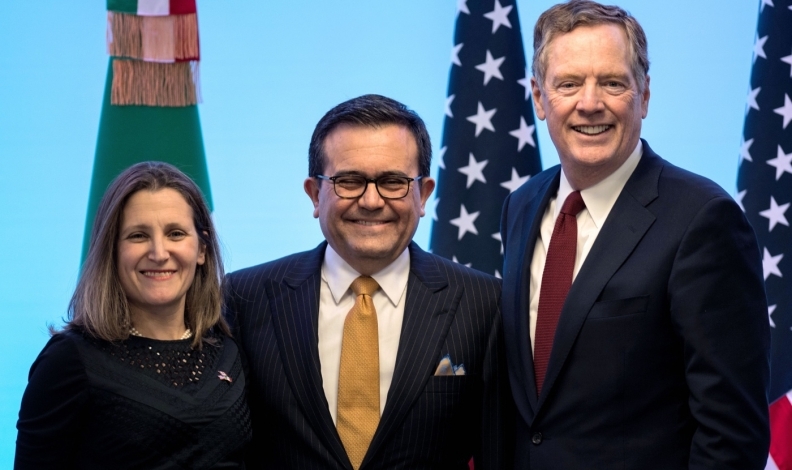 From left, Canadian Foreign Affairs Minister Chrystia Freeland, Mexican Economy Minister Idelfonso Guajardo, and U.S. Trade Representative Robert Lighthizer on March 5. WASHINGTON — The United States congressional leadership has indicated that it will not deal with a vote on NAFTA this year unless it sees the text of an agreement by the end of this week. That statement Wednesday by the top member of the House of Representatives illustrated the stakes for the coming days: either the countries strike a deal now, or the process will drag into next year. By next year, Mexico will have a new president, senior members of the U.S. Congress will have retired, midterm elections will have been held and the next U.S. Congress could have different priorities, adding new variables into the process. House Speaker Paul Ryan was adamant when asked whether the procedural rules of U.S. trade law require a text this week in order for there to be a vote by the time the current Congress wraps up in December. "This isn't my arbitrary deadline, that's just the way the (fast-track trade) law works." Ryan pointed out that he's intimately familiar with the workings of that 2015 law: "I wrote it." As it stands, the countries have one major issue in the talks nearly settled: autos. But other irritants like dairy, dispute-settlement rules, pharmaceuticals and public contracts continue to linger. Prime Minister Justin Trudeau this week told President Donald Trump that a new NAFTA is within reach, if the U.S. is willing to soften some of its other demands. Another big irritant is the five-year sunset clause proposed by the U.S. It's a unique provision that would end NAFTA after five years, unless all parties agree to extend the deal. Several speakers at a Washington event on Wednesday blasted the idea, including a Republican, a Democrat and two Canadians. The criticism was expressed in especially blunt terms by Canadian MP Wayne Easter. "This idea of a five-year sunset clause is absolutely crazy," the P.E.I. Liberal told a panel event near Capitol Hill. "I'll call it as it is: it's a stupid idea." Speaking at an event organized by the Canadian American Business Council, during a visit to Washington by a delegation of Canadian parliamentarians, the former dairy farmer also dismissed U.S. demands for an end to Canada's supply management policy for dairy products. He said supply management provides stability for a sensitive commodity, avoiding either over- or under-supply and catastrophic price swings: "Your dairy industry problem in the United States is not Canada," Easter said. "Your dairy industry problem is yourselves in the United States. You're producing too much product." Kirsten Hillman, Canada's deputy ambassador to Washington, spoke earlier at the same event and also questioned the logic of the sunset clause, although she did so in more diplomatic language. A former senior Canadian trade negotiator, Hillman said a trade agreement has two purposes — liberalizing trade and providing certainty. She said a five-year sunset accomplishes neither. "We set out these agreements and lock them down in international law, so that they survive from one government to the next, from one administration to the next, to allow our businesses to plan," Hillman said. "A proposal that would automatically terminate the agreement every five years runs directly counter to that fundamental principle of a trade agreement. So that's not a proposal that makes sense for Canada." She said Canada is willing to keep talking after this week, as is Mexico, but she conceded that time is running out to have an agreement negotiated, voted on and implemented by the current U.S. Congress. "The runway for this Congress is very short," Hillman said. "(But) not impossible."